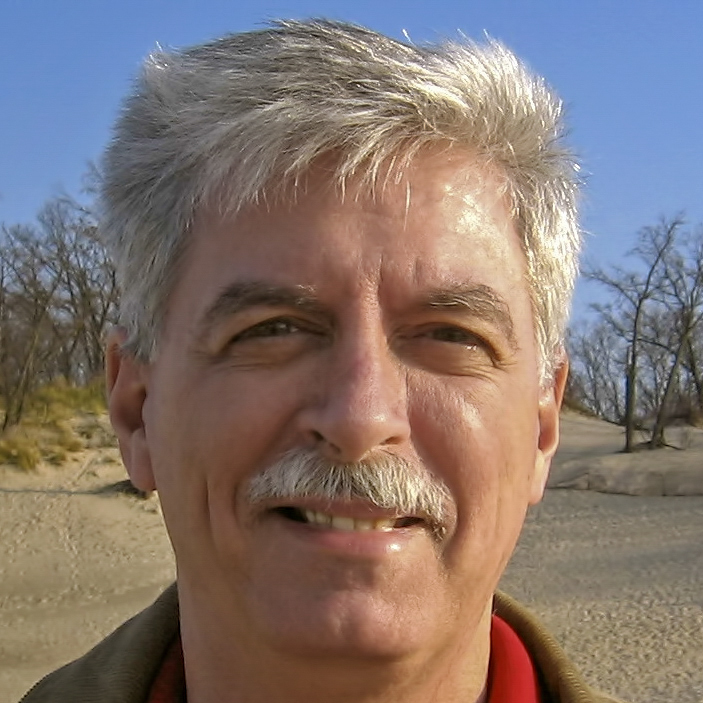 I. Congratulations, Indiana Dunes National Park! Continuing commentary appearing on this page will be dedicated to presenting a series of brief essays concerning the process or production of photographs, as well as offering perspectives on the relationship landscape photography has to other art forms. In addition, contributions here will focus on essential connections perceived between pictorial content and personal contemplation, especially when examining specific aspects innate to scenic depiction of natural settings. I am now pleased to see that the process begun by local leaders and social visionaries seeking to protect and preserve the environment of the Indiana Dunes, plus to raise its prestige as a national treasure, has finally achieved its goal. On February 15, 2019, a joint resolution of Congress—supported by Indiana Senators and House Representatives, both Republican and Democrat—to re-designate the Indiana Dunes National Lakeshore as the country’s newest national park was signed by President Trump. Consequently, I am delighted to witness fruition of that dream intent on sharing the richness and beauty evident in nature contained among the Indiana Dunes landscape along southern Lake Michigan, as imagined by early activists and later advocates such as Steven Mather, Frank V. Dudley, Jens Jensen, Henry C. Cowles, Richard Lieber, Thomas W. Allinson, Dorothy R. Buell, John T. Hawkinson, Jane Addams, Paul H. Douglas, and numerous members of the Prairie Club at the Indiana Dunes, just to recognize some of the crucial historical figures. Congratulations! Two of my primary teachers and influences—maybe even mentors, with whom I studied for years as a young apprentice—were the poets John Ashbery and Mark Strand, both also known as aficionados of art and authors of books containing criticism or commentary on visual arts. Moreover, John’s most famous work is a celebrated ekphrastic poem, “Self-Portrait in a Convex Mirror.” Additionally, although in interviews Mark took credit for writing only two truly ekphrastic poems during his career, he suggested many others might be considered as created ekphrastic compositions—a sort of notional ekphrasis—poetry revealing and reviewing scenes painted within his imagination, which seems appropriate since he began as a painter and an art student of Josef Albers at Yale University. Likewise, I have adopted some of the attitudes expressed by Ashbery and Strand in those prose writings linked with photographs exhibited in my “Photographs & Paragraphs” journal entries. I consider the commentary as ekphrastic paragraphs suitably complementary to my photos, seeking to combine simple description of the images (a verbal mirror) with an exercise—perhaps at times even an experiment—in language that examines and expands the framed setting on display, as well as offering the remembered experience or stilled moment frozen in the photograph through a brief yet loose or implied narrative. The result may sometimes be seen as documentary and sometimes deemed speculative, either inviting or permitting a certain range of emotional reactions from readers and, I hope, through tone, connotation, or symbolism opening the works to greater ambiguity and more complex interpretation. Since we celebrate the 150th anniversary of Frank V. Dudley’s 1868 birth on November 14, 2018, this seems an apt moment to again emphasize my appreciation for the influence and guidance he demonstrated as the “Painter of the Dunes,” whose artworks and friendly persuasion helped early efforts by activists in obtaining the protection and preservation of vast tracts of Indiana landscape adjacent to Lake Michigan. I have repeatedly written in my journal entries about the debt I owe as a photographer to Dudley for examples of artistic composition depicting details of the Indiana Dunes. Through study and exploration, I have determined the exact site—now unmarked and overgrown—where Frank Dudley and wife Maida lived in a cottage just above the beach of the Indiana Dunes. In a narrative from my journal written June 18, 2017, I explain: “As I always do when passing this way, I stay a moment to rest in the gray stain of shade beneath an isolated tree among the foredunes. Although the landscape before me may appear less interesting than other images I might capture today, this place has become my favorite location in the Indiana Dunes. I consider this a sacred space. Through research I’ve discovered here is where Frank V. Dudley, ‘The Painter of the Dunes,’ once built a cabin and worked in his studio facing Lake Michigan with the distant skyline of his Chicago home on the opposite side.” As my January 5, 2017 post notes, Dudley was “permitted to keep his cottage studio among the dunes, after the State of Indiana assumed ownership, for an annual rental fee of ‘one large original oil painting.’” Recognizing “his reputation as a crucial figure who championed the Indiana Dunes,” this contract was maintained until Frank Dudley’s death in 1957. Photographers and painters of natural surroundings, especially those who inhabit temperate zones like mine in the Midwest, learn to fully appreciate even the slightest changes of nature brought during transitions in all four seasons. Most of those I know who capture landscape images are educated and experienced in the intricacies of weather, as well as its impact upon the visual details of terrain framed by a camera’s viewfinder or brushed within the boundaries of a canvas. Although local conditions in the climate throughout every section of the calendar offer distinct characteristic elements to enjoy, many of my fellow photographers in this region anticipate the arrival of autumn scenery created by cooler temperatures as much as any of the other times of the year or divisions within weather patterns. When summer winds slowly shift to northern currents so that the air gradually chills in October or November, and the sun’s position in the sky begins to drift farther south each day, establishing sharpening angles of sunshine, the overall tone witnessed in snapped pictures frequently becomes more remarkable. As everyone is aware, the most noticeable feature of fall happens to be the grand transformation of trees and shrubbery. The sea of green leaves above me gives way to an array of shades, and a colorful chaos commands attention all around with its assortment of tints. Even looking down, I see those lost leaves that contribute color to the winding lines of trails beneath my feet as I hike through dune woods or forest ravines. Moreover, at times a crispness in the atmosphere brought by brisk onshore breezes will awaken the senses, and I find myself more alert to dimensions in texture, such as the crunch of hardened soil underfoot, the slick sheen of weeds polished by morning frost, or the caw of a lone crow overhead. Among the great traits of photography is the fact that it isolates and saves moments or memories, preserving brief periods and temporary states before they pass from our purview. Due to the fragility of fall and an especially nagging uncertainty about how many days—maybe an entire week, or perhaps two—peak foliage might last, anxiety can exist in the minds of those of us who wish to seize this fleeting season. We nervously watch weather reports for factors affecting peak season, and we seek predictions from interactive maps available in apps or at online meteorological sites offering fall foliage forecasts. We wait with great anticipation for the vivid scenic images of October and November, photographers hoping to provide permanence in the form of a magnificent print to those short-lived gifts from nature these late months bestow. Most readers know Barry Lopez as a highly-respected author of nonfiction and fiction focused on elements of the natural world, a writer whose works have received widespread praise and earned distinguished awards. For instance, Of Wolves and Men was a finalist for the National Book Award while Arctic Dreams was a National Book Critics Circle Award finalist and won the National Book Award. In an accurate yet elegant style of writing, Lopez fashions language that is learned, lyrical, and luminous, and his descriptive prose shows someone who perceives the world around him with visual acuity. Consequently, some might not be surprised by the fact that Lopez began his career as a landscape photographer whose words accompanied his images. As Lopez notes in “Learning to See”—an article first published in a journal (Double Take) during spring of 1998 and included in About This Life: Journeys on the Threshold of Memory, his collection of essays released later that same year—his landscape photography skills and portfolio of works were sufficiently advanced in quality to obtain an interview in the middle of the 1970s with an assistant editor at National Geographic for consideration as a staff member. However, since Lopez’s selection of wildlife photographs and people portraits was more limited, the magazine could not offer assignments. Other factors appear to have contributed to Lopez’s loss of enthusiasm as a photographer, including the desire by publishers only for uplifting and idealized visions of nature rather than realistic images that sometimes might be grim, as well as the exploitative use of nature and landscape photographs for advertising or promotional and editorial purposes. Still, Lopez expresses a continuing great admiration for masters of landscape and wildlife photography who maintain integrity. Consequently, whenever I photograph colorful fall foliage while hiking through deep dune woods or I preserve the sun setting beyond Lake Michigan from my tripod’s location on a beach, I believe the patience required and the deliberation directed toward various aspects of my surroundings—as well as the contemplation or considerations that arise during the activity—actually enhance my awareness of specifics in the environment. Therefore, in the photographic process, I see to learn, and I am able to retain then recall all when transitioning to placing words on a page. Much has been made in the history of photographic commentary about a seemingly simple but acute observation by Henri Cartier-Bresson concerning what he called The Decisive Moment, derived from a quotation of Cardinal de Retz on the opening pages and by the famous title of his celebrated book of photographs first published in America in 1952. (The French edition published at the same time carried a different title: Images on the Fly.) Feted as a master of various genres—including photojournalism, street photography, and fine art photography—in which he frequently captured candid portraits, his reputation might not easily extend to landscape photography. However, an expansive definition of Cartier-Bresson’s description of the decisive moment might apply to that form as well. Indeed, I have referenced the term in previous essays on landscape. Even during my decades as a creative writer I usually have found myself drawn to lyrical poetry rather than more narrative forms of literature. The stilled image in a poem offers further opportunities for speculation, interpretation, or a variation of perceptions by readers. However, as Cartier-Bresson notes, “the writer has time to reflect.” Authors can revise, rewrite, rearrange any element of a scene. The photographer cannot go back in time to shoot once more the fleeting instant evident in his or her image. Nevertheless, like a poem or a painting, a photograph offers a moment, perhaps mysterious or ambiguous, from which observers may surmise further context in place or time. This aspect of art, maintaining the mystery of the moment, intrigues me the most. Canon recently announced concluding sales of its final remaining single lens reflex film camera, the EOS-1V, which actually had been removed from production eight years ago but had been sold from old stock in its inventory. A digital range film camera, this model had been instituted in 2000, shortly after Nikon had released the initial digital single lens reflex camera in 1999. Canon also revealed cessation of repair service for the model will occur in 2025. The company had introduced its first film camera 82 years ago in 1936. Therefore, although a few brands still include film cameras in their offerings, this news report seems to represent an end of an era, especially for those of us who shoot with Canon equipment. Although I always acknowledge that I do not consider myself a gear guy and I rarely write about such technical subjects, as I hike trails and interact with other photographers along the way, we sometimes discuss and compare camera bodies, lenses, filters, and other elements of gear. When involved in those conversations, particularly with the younger individuals I meet, I am reminded how many never photographed with film and are unaware of the challenges or rewards one encountered while capturing images in manual focus on rolls severely limiting possible numbers of exposures and with their fixed ASA film speed, followed by developing negatives in a darkroom. My own recollections are shaded by memories of consciously counting shots on any outing to preserve an opportunity to take pictures throughout the trip and of cold rolls filling a shelf in the refrigerator, an effort to extend life of the film beyond its expiration date. As I have noted in previous writings, I also remember the darkroom conditions—including a costly, slow, and unpredictable process, contingent upon a lack of dust or leaks of light, as well as containing unpleasant chemical smells— all so delicate and to me often so frustrating. Nevertheless, an education in film photography instilled an appreciation for the art form that I might not have otherwise obtained. My understanding of the tools and techniques inherent in works by a past landscape master like Ansel Adams increased my admiration for his skill, in both the exposure of film and the developing of prints, although Adams operated with a large format film camera. Indeed, I continue to enjoy witnessing the continued use of such large format film gear by photographers like Ben Horne or Nick Carver, who regularly share their experiences in online video journals. Despite the various drawbacks obviously posed by the limitations intrinsic in film photography, valuable lessons learned through shooting with film would include the need to be more deliberate in composition and capture of images, as well as the placement of more importance on each frame in a roll of film, avoiding the digital “spray and pray” temptation. In fact, the absence of an electronic viewfinder screen to review scenes after each shot forces a more conscientious process upon the photographer. Moreover, with so much depending upon accuracy in every shot, the photographer must exercise greater care in focusing and lighting, attempting to get everything right in camera because the options for correction in developing are difficult or even impossible, especially when contrasted with the array of adjustments available in digital processing software. Recently, a photo showing one of the beaches at Indiana Dunes strewn with trash—including beer bottles, cardboard boxes, plastic cups, and aluminum cans—left by visitors on Memorial Day was posted online by Dig the Dunes, a local group interested in promoting and protecting the Lake Michigan shoreline. The image was shared on Facebook over 2,000 times, and its depiction of disregard for the environment evoked hundreds of emotional responses, most expressing anger, across social media. Perhaps this outpouring of outrage by members of the community represents a positive effect from the isolated incident, since that one regrettable act actually instilled greater awareness and dedication among many to keeping the region clean of debris. This situation also reminded me of an ethical approach to preserving the natural conditions of our surroundings practiced by landscape and nature photographers. A couple of statements addressing this issue can be found at the Nature Photographers’ Code of Conduct, presented by the Nature Photographers’ Network, and at landscape photographer Varina Patel’s web page, where she lists rules for engagement with the environment. Much of the guidelines can be summarized in one brief motto, “Leave No Trace,” which also happens to be the title of a document by the Center for Outdoor Ethics offering seven principles to follow during interaction with nature and wildlife. Obviously, landscape photographers have a practical vested interest in maintaining the scenery they need as subject matter. However, as avid devotees to natural settings, they also appreciate the precarious position of nature, particularly in higher traffic locations like the Indiana Dunes, frequently visited by summer vacationers or those locals simply seeking weekend getaways. When capturing images in nature, ethical behavior insists that the area ought to be kept as it was when the photographer arrived, if not better. Not only should all materials brought to the spot be carried away, but any trash found on site (water bottles, food wrappers, etc.) should be removed if possible. Moreover, a photographer must respect the original state of nature and prevent any adverse impact from one’s presence. Even if a thin limb or slim twig might impede the line of sight seen through a viewfinder, it has to remain in place. Additionally, caution should be displayed while walking across the terrain; for instance, being especially careful when stepping on sand in the Indiana Dunes where fragile foundational shoots of marram grass might be underfoot. Lately, some landscape photographers focusing on more remote locales in national parks or wildlife refuges have engaged in a related debate concerning identification of specific spots where favorite photos are composed. Some suggest a wise course would be to conceal such information to avoid an overuse of the location. Indeed, an interesting ethical dilemma arises as various well-known individuals even admit to providing incorrect or misleading details concerning whereabouts of certain shots to followers of their photographic work, a philosophy that some criticize as an elitist attitude but which the photographers justify as a way to safeguard the purity of a sacred place. A recent Vox article (“What Smartphone Photography Is Doing to Our Memories” by Brian Resnick) examines the influence of nearly universal access to cameras through smartphones on the ability to recollect experiences correctly. As I instruct students authoring memoirs or autobiographical nonfiction in my creative writing courses, whatever we remember arrives as an accumulation of various factors, resulting in some details that might be slightly in variance from actual events or derived from attempts to fill in gaps and supply context. In addition, our depictions of the past can be aided by others’ narratives or by moments preserved in photographs. Resnick reports that almost 80% of Americans possess smartphones, “and many rely on them for memory support.” However, some studies suggest the process of memorializing everyday events with such pictures “actually diminishes our ability to recall our experiences, diverts our attention, and takes us out of the moment.” Frequently, we forget to feel the wind, listen to the sounds of birds in the trees, or smell the scent of flowers. Consequently, for many individuals an action thought to increase memory instead causes a lessening of accurate recollection. Indeed, some researchers claim carrying a smartphone and depending upon it too much can cause a distraction and “cognitive offloading,” a situation where folks hope a device “will save a piece of information” for them, so “they’re less likely to remember it for themselves.” Moreover, when an image is captured on smartphone with a conscious knowledge it will be shared on social media—such as Instagram, Facebook, or Twitter—one sometimes views the instance from a third-person perspective, which leads to incomplete or distanced emotions compared to a more intimate first-person perspective. Of course, for those capturing scenes in the more careful and considered conditions involved with dedicated amateur or professional photography rather than the casual use of a smartphone, the outcome can be exactly the opposite, an enhanced sense of memory. In an experiment conducted by Linda Henkel, a psychologist at Fairfield University, participants who more actively and deliberately framed the scenery, perhaps by using a zoom lens to focus more closely, found their memories improved. In numerous experiences, whether patiently preparing to photograph a serene landscape setting or peering through my viewfinder at a sporting event surrounded by thousands of screaming fans, my attention to specifics in the atmosphere surrounding me magnifies, and I am able to isolate the moment for greater concentration. In fact, as I photograph the moment, I am more aware of the environment because I intend to save images that effectively reflect the circumstance and significance at the instant in which they were taken. I find photography, like creative writing, to be a thrilling process of discovery, and this perspective provides one of the primary reasons I enjoy both activities. Just as I never know for sure what I want to express in words until I complete a composition, I’m often uncertain about the value a photo might contain until I do the review during post-processing on my computer. Even then, I frequently discover to my delight that a picture I originally deem ordinary will garner greater reactions from those with whom I share it. Perhaps this response by the photo’s audience can be seen as similar to the considerations proposed by proponents of reader-response theory in literature, which suggests determination of a literary work’s merit or meaning occurs through the reception by its readers. Moreover, whenever I wander the landscape searching for settings to capture as images, especially during hikes through public parks, I am aware those locations I position within the frame of my viewfinder exist as spots in nature accessible to all. Consequently, the scenery may seem to be something less than unique and easily reproduced by others visiting the same place, particularly a landmark as familiar as Mt. Baldy at the Indiana Dunes National Lakeshore, which I include as an accompanying image. However, I believe much of the interest in this photograph results from decisions evident in my individual presentation—chosen angle of approach, exposure, lighting, focus option, etc. Indeed, I believe the way I produce an image, both as I take the shot and as I prepare a print, contributes to the treatment it receives when welcomed by observers. As in any art form, the inspiration and imagination employed during creation unite to offer a reproduction that is recognizable yet different—perhaps subtly but distinctly—from the source. As Susan Sontag suggested, the object photographed is appropriated by the photographer. Consequently, the camera serves as a tool of transition, changing the actual entity depicted on its sensor into an artistic representation. Ansel Adams famously remarked: “You don’t take a photograph, you make it.” When selecting a lens or arranging the camera settings, choosing to use a polarizing filter or graduated density filter, electing a time of day, arriving during weather with sunny or cloudy skies, situating the tripod and adjusting its height, committing to cropping, dodging and burning, and finalizing the print size or paper quality, the photographer in every step envisions and constructs an image almost in the manner a painter might. Although the photograph sometimes might appear to be a mere documentation of whatever vista an individual has witnessed during a hike, the captured image has its own identity. The photographer takes possession of this specific interpretation of his or her surroundings. Thus, each of the iconic images of El Capitan captured by Ansel Adams in various seasons and under diverse sunlight conditions exists as more than just a precise replica of the well-known tourist site. Likewise, I hope to discover my landscape photos present a personal vision of the environment I encounter. I must acknowledge that I am not inherently a patient person. Although I am sometimes told my public persona appears laid back and easygoing, my upbringing in New York City placed me in an environment that tended toward expectations of a quicker rate of movement and instant results. However, over the years I have transitioned to a more mellow approach during most everyday events, and not just because of my growing older or living away from a busy urban location. Indeed, I believe I owe much of my increasingly patient personality to the influence of examples set by my wife and my son, both of whom have repeatedly exhibited patience or perseverance. Nevertheless, I know they remain amused at times that I express frustration when stopped and waiting for a train at a railroad crossing or when working awhile to correct the technological glitch in a computer program. I’m aware I also display my underlying impatience daily when continually grazing through television channels on my remote control. I have adapted to the necessity involved in observing the development of a sunset sometimes for more than an hour, and then lingering a bit longer for the possibility of an afterglow even as the sun has disappeared beyond the horizon. Similarly, I am willing to accept occasions when the stunning sunset never materializes, despite my time spent passively attending to the setting before me, constantly ready to press the button on my shutter release. Part of the irony in landscape photography arises with the contrast between the speed of the blade closing the aperture, maybe measured in hundredths of a second, and perhaps the hour or more engaged in anticipation. In fact, the habitual use of a tripod slows the procedure, and the extended time frame permits a photographer greater opportunity for contemplation of the image that will be captured within the camera frame. I have frequently indicated in commentaries accompanying my photographs that Henry David Thoreau’s writings are among the works influencing my philosophy and process of photography or personal appraisal of nature. Along with examples set by landscape painters, environmental authors, and fellow photographers, Thoreau’s perceptive insights into one’s experience with the natural world often have helped shape my attitude toward the interconnectedness between visual representation and interpretative explanation of images. In an endeavor pairing prose and photography, I believe I bridge the verbal and the visual, applying words and phrases that help with my comprehension or appreciation of the incentive provided by imagery I encounter in the natural environment. Indeed, even as I create a visual composition for my photograph through the rectangular framing of scenery in front of me with the camera’s viewfinder, I am also always conceiving a vocabulary and narrative for composition of a prose caption to accompany the photo. Consequently, the elements captured on the sensor of my camera might determine particulars mentioned in the description during my commentary, just as my desire to address a specific observation of nature through an impression expressed in sentences and paragraphs sometimes aids in selection of details to be included within the framework of the photograph. Both perspectives become integral, even dependent upon one another, in the act of apprehending and admiring nature’s offering for inspiration. As Thoreau declared, determining what we “see” when we “look” around us, especially at settings noticed in nature, relies at times upon greater reflection, a thoughtful depth of understanding that supplements superficial two-dimensional depiction of scenery. Similarly, when photographic images complement language, uniting the two media frequently triggers greater interest and involvement among participants, further engaging everyone in the process of communication. Perhaps I identify more closely with this thinking because I believe my experiences as an author and editor can complement my practice of photography. Additionally, I frequently define the purpose of my ongoing Indiana Dunes landscape project as perhaps primarily documentary and secondarily as art; although, my main motive for merging the visual with the verbal during the process would be with the hope that both documentary and art are present throughout my endeavor. Indeed, in my previous essay, “Reflection on Representation and Explanation of Images,” I mention an approach I follow: “as I create a visual composition for my photograph through the rectangular framing of scenery in front of me with the camera’s viewfinder, I am also always conceiving a vocabulary and narrative for composition of a prose caption to accompany the photo.” I consciously use the word “caption” as the term for any explanation or information accompanying my imagery because it originates from the Latin capere for “capture,” which is the way photography is often perceived, as capturing an image. Although known nowadays mostly as a modern poet, Paul Valéry produced numerous essays on contemporary concerns and artistic developments, including commentary in which he spoke about the growth of photography in modern art or as a presence in everyday twentieth-century society. In “The Centenary of Photography,” a study originally published in 1939, Valéry addressed conflicting perceptions of photography as damaging or benefitting the act of authorship. As I have mentioned in previous pieces, my practice of uniting word and image seeks to allow photos to show the landscape in its authentic magnificence, while my accompanying writing presents explanations or offers narratives that provide context for the captured image being displayed. In a manner, this process blends artistic exhibition with documentary commentary. Therefore, to some extent, I follow Valéry’s call for respect of the photograph as principal source of romantic description at the same time that my language attempts to supply more realistic reporting through empirical observation. Almost all serious attempts at photography, especially as an art form, start with three features of the photographic process: shutter speed, aperture opening, and sensor sensitivity. No matter the content frozen within the frame of the viewfinder, this trio of elements primarily determines the final appearance of the image. Indeed, variations on this combination of choices could create pictures of the same scene but with a wide arrangement of depictions, each resulting in a very different impact upon the observer. Favoring one angle over another, as well as settling upon what should be omitted from the field of view, suggests a control over composition. Similarly, waiting for the right instance to snap the shutter release allows for command over such aspects as lighting or positioning of moving objects within the setting. Berger elucidates: “A photograph, whilst recording what has been seen, always and by its nature refers to what is not seen. It isolates, preserves and presents a moment taken from a continuum.” Consequently, though not always aware of it, viewers are impacted by those bits of information left out by the deliberate limitation caused by the photographer’s framing of a scene. Furthermore, a still photo represents a pause in the chronological order, which permits one to linger longer with an instantaneous impression. Certainly, some options are ruled by the type of photography—portrait, sports, landscape, etc.—and the specific conditions—illumination, movement, viewpoint, etc.— of the surroundings (natural or artificial, outdoor or studio) during which the task at hand is undertaken. Moreover, additional courses of action occur during the darkroom developing or digital processing stage.